Is Your Detergent Stimulating Your Depression? I've known since I was a kid that fragrances were bad for our health because my mom would never buy detergents or soaps with fragrance in them. But I would still continue to buy artificially fragranced-packed products like my candles, shampoo, and makeup. We have now officially "ditched and switched" our soaps, shampoos, candles (we now diffuse or just use unscented bees-wax pillar candles if we want to burn some), and most of my makeup and it feels so good to know that those fake smells and chemically-loaded products are gone from our house and in turn, our bodies. All of these products like to make us think they are good for us and made from nature, and maybe some of them are with most of their ingredients. But the second you see "Fragrance", "Perfum", or "Perfume", anything scent-related, ditch it or refrain from purchasing it. Remember, read your labels! It's so important. Even many natural and "certified organic" products we see in stores have fragrance in them - most of which is fake. All of the above beauty products are scented with fragrance, even the "Organix" brand, the "Natural Charcoal lotion" and Maui Moisture. Tossing them all right after I take this pic! So with that in mind, take the following into consideration when you're shopping for products that may include fragrance from here on out. These include any and all detergents, dryer sheets, fabric softeners, soaps, hand sanitizes, lotions, deodorants, shampoos, conditioners, all baby products (shampoo, wipes, diapers, etc. ), cleaning supplies like your disinfectants and dish detergents, and all air fresheners like sprays, gels, plug-in's, everything! Products with scents like "Sandalwood and Vanilla" or "Cucumber Mint", or "Amber Coconut" sound like they'd be more natural than "Fresh Mist", "Mountain Rain", or "Holiday Spice" don't they? Unless you're actually on a mountain during a rainstorm, there's nothing "Mountain Rain" about what you're buying except for the pretty picture on the front, trust me. These companies want us to think they're natural, when they're actually filled with toxic chemicals that we both inhale and absorb through our body's largest organ - our skin. "Fragrance" ingredients are NOT required by any US law to be listed on the labels of their products. There was a study conducted in 2010 on 25 widely-used fragranced consumer household, beauty, cleaning, etc. products identified 133 volatile organic chemicals (VOC's), 24 of which are toxic under federal law. Only 1 VOC was listed on any product label. ONE! Volatile Organic Compounds/chemicals can occur naturally or man-made, and can easily become vapors or gases at room temperature. They are found in fuel-burning, gas, wood, and kerosene, tobacco products, hair sprays, perfumes, cleaning agents, paints, lacquers, varnishes, and even from print and copy machines. You can read more about VOC's on your own... But you get the idea. According to the US Environmental Protection Agency, about half of the products emitted chemicals with zero safe exposure level. Eleven of the products had "organic", "non-toxic", or "green/natural" labels and their emissions of VOCs with toxic, hazardous, or carcinogenic classifications were not significantly different than those not labeled as such. Greeeat..... In addition to the immensely complex mixture of the product's base, one single "fragrance" in any product we use can contain up to several hundred substances among the over 2,600 substances that are documented as fragrance ingredients, both natural and synthetic. None of the products listed all of the chemicals that were emitted. Fourteen of the product labels didn't even list "fragrance" in their ingredients, which apparently is against the law. And guess what - the formulations are confidential. Surprised? I'm not. We can quickly absorb these chemical-infused fragrance particles whether we like it or not! Fragrances of all kinds are constantly being released into the air through tiny little oil droplets from people's clothes, perfumes, cigarette smoke, air fresheners... Ever been to the store and had a guy walk past you and you smell his cologne five seconds later? Or when you walk past the detergent aisle at Target and (I immediately get a headache) the smell of everything is just permeating the aura around that aisle? That is due to the scented droplets in the air, emitted from those products. (The concept of traveling scented particles through the air may seem obvious, but that's why it's funny to me when people as about Essential Oil diffuser and if they work and the answer is YES! Just think about how scented particles travel in any other area of our lives. The same works with high-quality essential oils being diffused into the air, only instead of nasty carcinogenic chemicals, they have beneficial properties!) Anyway, these tiny little molecules of fragrance adhere to anything they touch - people, furniture, pets, food, etc. You know when you go to your friends' house one day and then you put your coat back on the day after and you're immediately like, "wow my coat smells like so-and-so's house"...? This is why. All of their detergent/cleaning/air-freshener particles have permeated your clothing. Imagine what's gotten absorbed into your skin! So how do these chemicals affect my health? Our bodies absorb them through direct application of course, or another form of exposure. Sometimes the surface tension of our skin can be altered, which affects the absorption of other fragrance chemical components into our skin. The stratum corneum, or outer skin's layer, store these fragrance chemicals and slowly release them into the blood vessels that lie directly below the skin. The chemicals enter the blood stream and affect every cell and organ system in the body before eventually entering the liver for detoxification. Think about how many chemicals we potentially expose our skin to each day - through our clothing, bedding, shampoo and conditioners that run down our bodies in the shower, soaps, lotions, etc. - everything I mentioned above. An infant's skin is especially susceptible to absorbing fragrance chemical oils. SKIN - These fragrances can be allergens, photosensitizers (which basically means that they can produce a chemical change when exposed to light - I may research this in time, more on this later..), cause skin irritations like eczema, dry skin, redness, cracking and itchy, burning, flaking, etc. These fragrances can also irritate or dry out our eyes too. RESPIRATORY SYSTEM - This system includes our sinuses, nose, mouth, throat, and lungs. Fragrances can induce or stimulate respiratory problems. These chemicals cause inflammation, increase in mucus production, and make us much more susceptible to bacterial and viral infections. They can also worsen asthma, coughing, bronchitis, and sinusitis. NEUROLOGICAL EFFECTS - Fragrance chemicals can affect our entire nervous system, including our brain. Some effects are immediate and non-permanent, while others are chronic and last for a very long time. Symptoms include migraines, depression, confusion, irritability, panic attacks, memory loss, aggression, impaired concentration, insomnia, and loss of muscular coordination, just to name a few. ENDOCRINE HORMONE-DISRUPTING EFFECTS - This is a biggie. Our Endocrine System is our body's control center, really. It affects our moods, libido, metabolism, energy, and so much more (I have a new obsession with learning about he Endocrine System so I plan to talk a lot more about this in the future). 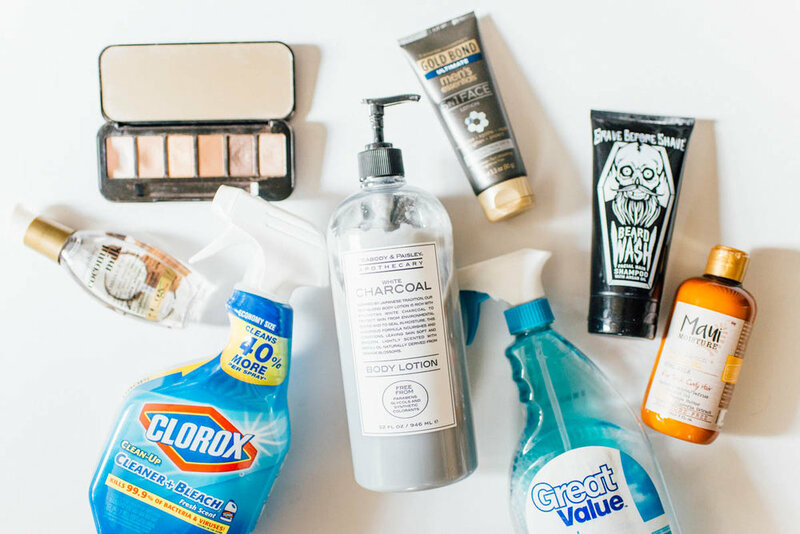 While the number of fragrance chemicals that have endocrine-disrupting properties is unknown, these chemicals do have large amounts of phthalates, which are a group of toxis semi-VOC's that are known to disrupt estrogen and testosterone metabolism. Phthalates are used to impart an oily moisturizing film and to help dissolve other ingredients included in the product's mix. The phthalates that are also in the plastic containers of these products can leach into the contents themselves. (Get rid of as much plastic in your household as you can! Especially kid's toys - think about it - many of these problems didn't exists years ago when kids played outside 24/7... There are no plastic trees, sticks, meadows, or imaginations! Read this link for more info.) Obesity is a definite example of how these chemicals cause the endocrine hormone disruption of fat metabolism. You can read more about this process on your own, but it's no doubt that the epidemic increase in obesity and diabetes in the last 20-30 years is in direct correlation with the huge increase in fragrances products. NO doubt. Once you learn about how the e-system works, I'd imagine that you'd agree. And listen to this - Phthalates have been associated with the following: thyroid disorders, sperm damage, infertility, miscarriages, and birth defects. SYSTEMIC EFFECTS - Fragrance chemicals are traced throughout the blood as a result of being absorbed via skin contact, inhalation, and ingestion. They can irritate our endothelial cells that line the insides of our blood vessels, causing blood vessel dysfunction in any organ system throughout our entire body. These chemicals can react with other indoor and outdoor chemicals (like the ozone) to form secondary pollutants like formaldehyde. Like I said before, fragrance chemicals are absorbed through the skin and can circulate throughout the entire body and major organs before making it to the liver to be detoxed out. Let's give our livers a break! These chemicals can cause fatigue, cancers, damage to our kidney and liver, make us nauseous, sick, and poorly alter our immune systems! AIR, WATER, AND ENVIRONMENTAL - The widespread use of so many of these fragranced products is causing extensive pollution, not just indoor, but outdoor too. Waste water treatment doesn't remove the increasing quality and types of fragrance chemicals, many of which are persistent and accumulate in the environment. It's really important to make sure you're drinking filtered water, and limiting your exposure to in plastic bottles. Think about the ways we could change the future of our lives and the lives of our children just by making some better choices in our household products! All of these reasons are why I've fallen so in love with my Essential Oils. Removing as much exposure to these toxic chemicals as we can doesn't mean we will never smell good, can't enjoy a nice fragrant home, or wear perfume! We just have to make smart choices in how we do so. I'm excited to share more about the benefits of Essential Oils with you in the future, and new products and recipes to make products you use every day that don't include those nasty chemical fragrances, but for now, here are a few things you can do to make steps towards making better choices in your home and for your family! 1. If you use them, throw away your dryer sheets! Use wool dryer balls instead. They'll help cut down on your dry time as well as soften your clothing without the use of nasty chemicals. I put a couple drops of EO's on mine and our clothes come out smelling fresh and more potent than the dryer sheets ever did. 2. Download the "THINK DIRTY" app. My friend natural mama friend and oils enthusiast Amanda Nash told me about this and I love it! It allows you to scan the barcode of a product you have (detergent, soap, etc.) and it will rate the product for you on a scale of I believe 1-9 and give you the level of toxicity it has. You'll find that anything with a "fragrance" rates very high (toxic) on the rating scale. This will help give you a general idea of where you are with your products. 3. Start tuning into the way you and your family members feel or the way your skin or eyes might react after the use of a product, lighting of a candle, etc. Are there any behavioral changes you or your kids have been going through? What about health conditions? Asthma? Anxiety? Depression? Headaches? Stubborn weight? Start to tune in a little more things you may be ignoring and try to start noting a correlation with potential chemicals you might be exposing yourself and your family to. And don't feel guilty! Please - we don't know until we know, ya know? There are bounties of endless information out there to learn and it can all become very overwhelming. God is in ultimate control of our lives and only he has the power to cure, sustain, heal, and give life. But we still need to be good stewards of what he's given us and take care of these amazing bodies we have that work so wondrously. I believe our bodies have the ability to heal themselves if given the proper tools and environment, so that's what we need to be working towards in order to better the quality of life we have while we're still here! If you have questions about how to further your journey with Essential Oils or a natural lifestyle, please reach out! I'd love to talk with you about how to get started. Feel free to shoot me an email at hello@sunflowerandfig.com.